This is a continuation of a previous blog post, the first part of which you can read here. If I was looking for a job, and I saw that a company was backed by Sequoia Capital, I would be tempted to go work for them - even if their founders were five years old. Here's a list of companies whose Series A or B rounds (or both) were led by Sequoia: Apple, Google, Yahoo!, Stripe, Dropbox, YouTube, Instagram, Airbnb, and WhatsApp. The creative spirits. The underdogs. The resolute. The determined. The outsiders. The defiant. The independent thinkers. The fighters and the true believers. We’re serious about our work, and carefully choose the words to describe it. Terms like “deal” or “exit” are forbidden. And while we’re sometimes called investors, that is not our frame of mind. We consider ourselves partners for the long term. If that doesn't capture the ethos of Silicon Valley, I don't know what does. This is a criteria that I would intuitively award more stars to, but that even investors themselves would warn against overvaluing. So I compromised, and gave it 4 stars. Silicon Valley has a hierarchy in its investors. The top-tier is generally agreed to consist of: Sequoia, Kleiner Perkins Caufield Byers (KPCB), Greylock, Benchmark, Accel, and Andreessen Horowitz.1 Other well-known venture firms include General Catalyst, New Enterprise Associates (NEA), and Lightspeed. These are the venture capital firms that, in general, attract the best founders, win the best deals, and show the highest returns. Even the best firms, however, often miss great deals, so the failure to raise funding from one of these groups does not necessarily imply weakness. This is particularly true of companies founded outside of the U.S., and of very promising founders who may have weaker connections to Silicon Valley's old guard (though these firms have gotten pretty good at identifying unknown upstarts). On the flip side, not all companies funded by top-tier venture firms are excellent places to work. It is the nature of their business that venture capital firms will invest in a large number of companies that will fail. More than that, promising companies can sometimes degenerate if their growth is achieved at the cost of their culture or values. Regardless of who is backing them, such startups are best avoided. The funding statistics in this section are based on a 2017 article by TechCrunch that looked at 15,600 U.S.-based tech companies founded between 2003 and 2013. As a sanity check, I also compared these numbers with those from a similar Business Insider article from 2016. The BI funding statistics are slightly more conservative. The number of rounds of funding raised by a company is a decent indicator of how much risk the startup has neutralized, or in other words, how likely the company is to succeed at some level. A company that has raised a seed round is officially a funded startup, but is still "high risk", as only about 40% of seed-funded companies go on to raise Series A rounds, and only about 9% get acquired. Seeds rounds are usually raised from individual investors (i.e. angels) or specialized funds, such as Y Combinator, Founders Fund, and SV Angel, and generally involve on the order of $0.5-1 million in capital. A company that has raised a Series A round should be considered "moderate risk". 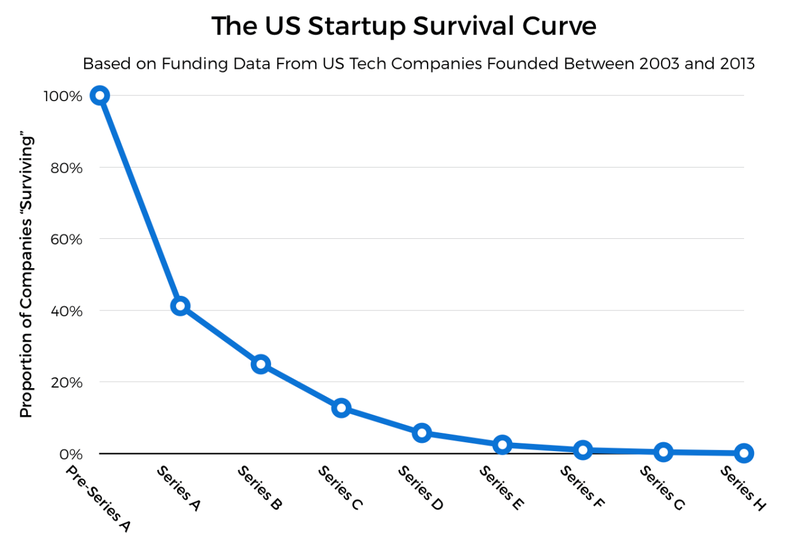 Of companies that raise an A round, about 62.5% go on to raise a Series B round, and 7.5% get acquired, which implies that the other 30% likely die. In terms of career growth and financial upside, this is probably the best time to join a startup that scores highly on all of the other criteria. Series A companies still have high growth potential, and yet have been formally validated by a group whose full-time job it is to evaluate early-stage startups. As a prospective employee, you now have an additional data point: the reputation of the venture capital firm that led the Series A round. Series B round companies should be considered "low risk".3 For one, companies that have raised a Series B are almost always generating revenue. Series B round investors look for evidence of healthy growth in users or customers since the A round, meaning that Series B companies have been validated not only on company fundamentals (team, product, market) but also on more complex signals, such as product-market fit. The median Series B round size, as of July 2015, was $18.4 million, implying that the median Series B company is valued on the order of $100 million. Note also that raising an advanced stage of funding (e.g. a Series D or E round) doesn't signify with certainty that the company is immune from death. Silicon Valley history is replete with examples of startups that were valued at or over $1 billion, and were later acquired for much less than that (e.g. Gilt Groupe, One Kings Lane, LivingSocial) - i.e. companies that raised a lot of capital, and then floundered. So I equate rounds of funding with neutralized risk simply as a rough heuristic for estimating the risk-reward tradeoff involved in joining a company. I would highly recommend asking a founder or executive about the company's current runway during the interview process. This is an estimate for how long the company could stay afloat, given the cash in its bank and its current rate of spending (i.e. burn rate), were it not to raise any more capital. Asking this question definitely does not constitute a faux pax, and an evasive answer should be cause for alarm. Every year, Wealthfront identifies a set of "career-launching" tech companies for aspiring young professionals by surveying the partners of 14 top venture capital firms. The qualifications for making the list are: 1) a revenue run rate between $20-300 million, and 2) a growth trajectory of over 50% over the next three to four years. Wealthfront's 2017 posting identifies 132 such companies. Of these, about 61% are located in the San Francisco Bay Area, followed by 10% in New York, 5% in Boston, another 5% in Southern California, and 4% in Seattle. 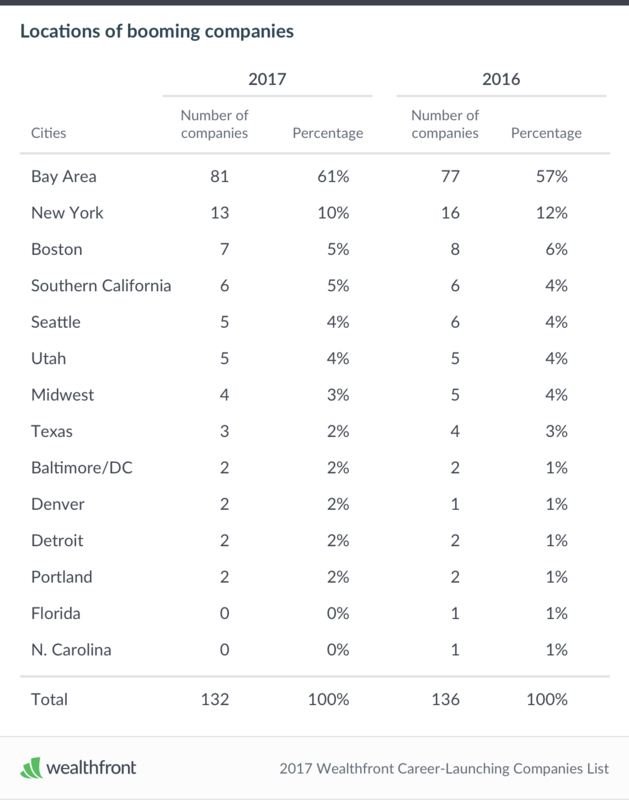 Of the Bay Area companies, about 58% are located in San Francisco itself. Treat location as a fairly grainy, but binary signal of a company's prospects. A company based out of San Francisco, Palo Alto, Menlo Park, or Mountain View is obviously not guaranteed to be successful, but a company not headquartered in the Bay Area or New York (and maybe Boston, Seattle, or LA) is going to be fighting an uphill battle finding investors, attracting and retaining strong employees, and (in many cases) connecting with its early adopters. I want to play devil's advocate and argue that what a company builds may not actually be that indicative of whether the company would be a good fit for you. Let's say you're interested in machine learning, but you think enterprise tech is super boring. You could find a job at a MLaaS company[^7] which builds tools to help genomics researchers more efficiently construct data pipelines, and visualize their results. You thought you'd never enter a world in which companies use aggressive sales tactics to upsell overpriced software to other companies, but you come to realize that writing tools for a small number of clients who place extreme value in the products you build for them is actually quite fulfilling. You could also find a job at a consumer-facing company that uses machine learning to personalize the content it serves users, and to customize the ad copy it shows them based on the cookie-infested websites they visit. You realize that linear regressions still do pretty well on these kinds of tasks, and though you were initially very excited about contributing to a service that your friends use, it is not actually super riveting in the day-to-day to work there. The point here is that you should be open-minded about the kinds of problems you could be interested in, and the kinds of work you'd like to do. Don't judge companies solely on their one-sentence mission statements. Instead, take the time to understand what the startup really does, why the problem they're solving is an important one, and what the immediate and future market for their work is. Relatedly, how much does the nature of the work that you do - full-stack, backend, cloud platform, data science - matter? Your interests matter, and developing an area of competitive advantage as an employee can matter. In startups, however, initial job title and responsibilities are generally dwarfed in importance by the pace of the company's growth. A small, fast growing company will require you to wear many hats, regardless of what your job description says, and assuming it is well managed, should reward strong performance commensurately. A lot of graduating students think I just want to work on the hardest problems. If you are one of these people, I predict that you're going to change your perspective over time. I think that's kind of like a student mentality, of challenging yourself, and proving that you're capable of it. But as you get older, other things start to become important, like personal fulfillment, what are you going to be proud of, what are you going to want to tell your kids about, or your grandkids about, one day. How will the work that you do add value to the world? As Moskovitz says, this is not a given for every startup. Life is too short to work for a company that does not do work that matters to you, and that matters period. While I've addressed the basic criteria for evaluating startups, some of the most important markers of a company's destiny cannot be captured in numbers. How much do users love the product? Do they tell their friends about it? 0 to 1 products. These are services that are the first in their kind - not derivatives of existing ideas (e.g. Uber vs. Uber for pet sitting). 10x products. These are services that are at least an order of magnitude better than whatever is used instead today (e.g. Google search vs. Yahoo/Alta Vista). The great paradox of entrepreneurship is that it is often easier to build a company to solve a hard problem than an easy one. Space exploration, driverless cars, curing infectious disease - these are the ideas that excite and attract smart people, and that inspire loyalty in trying times. That said, do not discount products that seem like toys as trivialities. Facebook was once just a tool for Harvard students to stalk each other, and Snapchat was something worse. Today, Facebook connects two billion people around the world, and Snapchat enables a hundred million to communicate more authentically. This is where the first criteria becomes useful. Early Facebook users spent hours clicking from profile to profile (okay, maybe some people still do this), so engrossing was the data that Facebook had made available on their friends. In its IPO filing, Snap revealed that the average daily active Snapchat user opens the app 18 times a day. Through the dot com bust and the rise of mobile phones, three survivors emerged from the Internet era: Google, Facebook, and Amazon. Google indexes the world's information, Facebook indexes the world's people, and Amazon indexes the world's products. Though on decidedly shakier grounds, the mobile era has spawned its own behemoths. The three enabling forces here are messaging (i.e. low-latency, mobile web-based message exchange), the camera (i.e. the dual-facing, integrated recording device), and location (i.e. high-precision global GPS), and their flag-bearers WhatsApp, Snap, and Uber. In a similar way, each technological wave spawns companies of all kinds, but the most persisting are the ones that encapsulate the simplest, most fundamental ideas. This is always easier to spot in retrospect, of course. The best companies tend to execute on ruthlessly narrow domains to start out, and then expand rapidly to realize a wider potential. Early Google ranked textual pages. Early Facebook connected college students. Early Amazon sold books. Today, Google is using AI to drive cars, Facebook is beaming down Wi-Fi to the world's disconnected, and Amazon is launching drones to automate delivery. Their operations span continents, and each wields power rivaling that of the Roman Empire at its height. Though each of the three had humble origins, even in their early days you would have found markers of greatness. The most important such marker is explosive growth. The best consumer companies are like child prodigies - they grow faster than you would think possible, racing past milestones that other, more mature companies, run by professional CEOs and seasoned C-suites, struggled to reach. Of course, like child prodigies, some flame out early (e.g. Yik Yak), while others fail to mature into healthy, cash-flow positive adults (e.g. Twitter). But every decade, two or three chart their way to adulthood fame. I'm not suggesting that a startup is only worth joining if it resembles Google circa 2000 or Facebook circa 2006, but studying the characteristics of the really successful companies is still a useful exercise. Not every startup has a glorified origin story. Companies such as Airbnb, SpaceX, and Tesla weathered many near-death experiences in their early days. In more cases than not, the cost of greatness is great struggle. So while you can't compare every company to Instagram, which crossed 100,000 users less than a week after its launch in October 2010, you can learn to spot the markers that signal that a company is promising, and on a trajectory that could take you places. I hope this piece serves as a useful guide at least for the common cases, if not for spotting the next Facebook in its infancy. Thanks to Hansen Qian, Chris Kuenne, Andrew Ng, Adrian Colyer, and Sanjay Jain for reviewing drafts of this post. Two kinds of funding rounds can actually be indicative of problems in a company. The first is down rounds. These are almost always bad, as they imply that a company was obliged to raise funding to stay alive, but had to do so at a lower valuation than in its previous round of funding - something that is bad for all existing shareholders of the company. The second kind is debt financing. In such a round, a company raises debt, which must be paid back with interest, instead of ordinary capital. This has become a common practice among very mature private companies, such as Uber and Snap (before its IPO), which often need more cash, but either do not want to further dilute shareholders or cannot find a bank willing or able to invest at their current valuation. The general consensus is that debt financing in later fundraising rounds is more acceptable than debt financing early on, but this is an intricate topic, and it's worth understanding the full implications of a potential employer's funding history. In this discussion, I use terms such as "high risk" and "low risk", but as I mentioned in a previous footnote in Part I, defining risk is tricky, because the definition of success for a company's employees is stricter than the definition of success for the founders and early investors.